PEARL HARBOR - The America Amphibious Ready Group (ARG) and embarked 15th Marine Expeditionary Unit (MEU) departed Joint Base Pearl Harbor-Hickam, Hawaii, after a scheduled port visit, Jan. 24-25. The amphibious task force consists of the amphibious assault ship USS America (LHA 6), the amphibious transport dock ship USS San Diego (LPD 22), and the amphibious dock-landing ship USS Pearl Harbor (LSD 52). They are currently heading across the Pacific toward their homeport after wrapping up a seven-month deployment to the Indo-Asia-Pacific, Middle East, Horn of Africa and Mediterranean. "I remember prepping for our first exercise (sustainment exercise) in Hawaii, and now we are back, but we have all grown so much since the beginning of deployment," said Cpl. Cody Morton, a Light-Armored Vehicle technician for the 15th MEU Command Element aboard San Diego. "This is an exciting stop because we are so close to home." While in Hawaii, the ARG/MEU Sailors and Marines had an opportunity to see some of the island of Oahu, conduct scheduled maintenance, and on-load food and supplies. For many of the Sailors and Marines this was their first time visiting the island of Oahu. "I'm glad we had the chance to experience Hawaii," said Gunner's Mate 2nd Class Dakota Harris, assigned to the San Diego. "We all had a great time going to the beach and eating some authentic Hawaiian food." 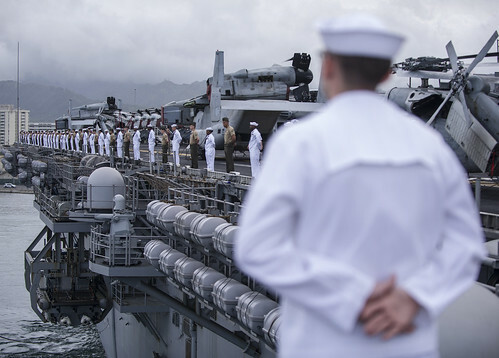 The crews were also greeted by family and friends in Hawaii who will ride the ships as "tigers" during the transit to their homeport of Naval Base San Diego. "I'm looking forward to my kids coming aboard the ship since they have never been underway before," said Lt. Cmdr. Elise Brandon, assigned to Fleet Surgical Team 1 aboard America. "We haven't seen each other in seven months, and I can't wait for us to spend the tiger cruise together." Tigers aboard the ships will participate in a number of events that cover the spectrum of the ARG/MEU's operations and daily functions. From damage control and flight-ops demonstrations to movie nights and ice cream socials, the tigers will get a glimpse of what it is to be a Sailor or Marine underway. "At the end of it all, the tigers will have an opportunity to earn a special qualification for having completed the cruise with us," said Chief Navy Counselor Eric Torra, America's tiger cruise coordinator. "This is a great experience to be a part of because it brings us and our loved ones just a little bit closer by having them see where we live and work while away for all of those months, and hopefully gives them a whole new appreciation for the military." Under the operational control of Amphibious Squadron (PHIBRON) 3, additional units deployed with the Amphibious Task Force consisted of the "Wildcards" of Helicopter Sea Combat Squadron (HSC) 23, detachments from Assault Craft Unit 5, Naval Beach Group 1, Beachmaster Unit 1, Fleet Surgical Team 1 and Tactical Air Control Squadron 11. America, along with Pearl Harbor and San Diego, are comprised of more than 1,800 Sailors and 2,600 Marines. The 15th MEU is a Marine Air-Ground Task Force comprised of a ground combat element, Battalion Landing Team 1st Battalion, 5th Marines; an aviation combat element, Marine Medium Tiltrotor Squadron 161 (Reinforced); and a combat logistics element, Combat Logistics Battalion 15. U.S. 3rd Fleet leads naval forces in the Pacific and provides the realistic, relevant training necessary for an effective global Navy and constantly coordinates with U.S. 7th Fleet to plan and execute missions that promote ongoing peace, security, and stability throughout the Pacific.